We’re going to try something new here at Indolaysia. Rather than just posting abroad–which means lots of posts smashed together, but lots of time in between trips–I’ll try to post a bit more frequently on research-related topics. Not too often; I generally come up with about two new pieces of research per year, which isn’t much. But I think there’s an argument for using this space for some more discussion of Indolaysia-related professional matters. I also think it high time that I worked harder communicating my research to broader audiences (like the readers of this blog, which include I think my mom and two other people). So that introduces today’s post, a discussion of my latest paper, first presented at ANU, most recently presented at APSA in Seattle last month, and this month to be presented at Temple and UCSD. 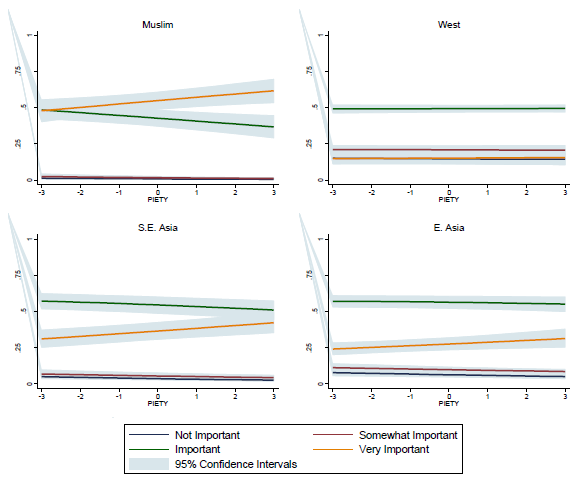 I’m calling this paper “Islam, Ethnicity, and Global Engagement.” The idea behind the paper is that we don’t know a lot about public opinion in the Muslim world towards the United States. The problem is not that there’s no research on this, but rather that the research that’s out there asks questions the wrong way. We tend to think “do Muslims in, say, Indonesia prioritize relations with the West or with the Muslim world?” Asking a question this way implies a binary opposition between the two choices. It’s entirely possible that Muslims like both. In fact, our experience in Indonesia suggests that most globally aware Muslims are pretty keen on both the West and the Muslim world. If you force these two to be mutually exclusive, you’ll get answers but they won’t make sense conceptually. Then add in the idea that most Muslims probably don’t actually foreign relations in terms of just the West or the Muslim world. In most of Muslim Asia and Africa, regional engagement is at least as important. It’s an obvious point when you think about it, but this isn’t often taken into account when we do research. But it has important consequences. If you find that Muslims in Indonesia prioritize relations with the Muslim world and not with the West, that might mean that they are something like “Islamists.” But it also could mean that they’re just “anti-Western,” which need not mean the same thing. If you added a third group, like Southeast Asians, then you could distinguish between the two possibilities. If they are equally keen on SEA and the Muslim World, that suggests that they’re anti-Western in general; if they prioritize the Muslim world against both SEA and the West, then it suggests that Islam means something. The point of “Islam, Ethnicity, and Global Engagement” is to highlight these important issues, first, and second, to propose a way to model them statistically. I propose a way to study questions like these, which I denote as multidimensional non-exclusive ordered choices, that allows me to add third (and fourth, and fifth…) dimensions into this question–so I don’t have to assert that only the Muslim world or the West are relevant to ordinary Muslims. At the same time, I can test whether the various identity dimensions are mutually exclusive rather than assuming that they are (or are not). And finally, I show how to use this method to compare the ways in which, say, religiosity or ethnicity or other factors shape the collection of beliefs about different kinds of countries. I use really neat Indonesian survey data to do this. The benefit of all of this is that I can make pictures like this. The point: the world is complex, much like we thought. But we can discipline that complexity and learn about it if we use the right tools.